Cart recovery isn’t a new concept any more. Yet you’d be surprised how many online retailers have been reluctant to invest in it, despite the opportunity for big returns. Around 73% of marketers see ‘driving new customers’ as their highest priority, according to research by ALF Insight. Many of these customers will now come from website pages for ecommerce stores, and Cart Recovery has become a vital tool to convert some of the 76% of shoppers that abandon orders before completing the payment process. There are now many well-established firms that offer to track these shoppers and trigger marketing communications if they leave your website. So if you’re looking to improve your performance online, what should you be asking the providers? #1 Do they use ‘real-time’ technology? When somebody leaves your website without completing a purchase, it’s important you move quickly. Companies that contact prospects within 15 minutes are 3 times more likely to make a sale than those that delay for an hour. Customer engagement is key to increasing revenue in modern ecommerce, so it is essential that your provider tracks shoppers, captures their details, and makes contact in real-time. #2 Do they use a multi-channel solution to retarget customers? There are hundreds of companies that can offer an email solution to send cart abandonment emails immediately after a customer has left your site. This is a cost-effective way of maintaining contact through quiet stages in the customer lifecycle. However, it is not the most effective method of increasing revenue, nor is it appropriate for all online purchases. It’s best to use a varied multi-channel strategy, such as using phone calls, text messages and email to increase the ways your company can connect with a customer. It’s not just about bombarding them with messages, but more about using the most effective communication channel at the most appropriate time. #3 How do they prioritise your best leads? Getting leads from your website is great, but contacting your most valuable leads first is an important part of making a Cart Recovery strategy as profitable as possible. When your sales staff are handling calls, each lead that comes in from your website should be assigned a priority value so the most profitable ones are handled first. For example, if you run an online golf store you may want to speak to a customer who abandoned a full set of clubs first, before one who abandoned a bag of tees. This way you can make sure your company is securing the most valuable business first. #4 Do they offer a phone solution? Conversion rates from email-only campaigns rarely surpass 5%, even if they’re well designed. So it is important you consider other channels that will convert a higher percentage of your website visitors. By triggering timely phone calls to customers that abandon carts, you could potentially recover in excess of 20%. For higher value basket totals, it should be essential practice to create priority values and send them to the top. For carts that are less valuable, it may be better to send an email or SMS message to save on resources. #5 How effective is their email solution? Personalising a remarketing email to suit the needs of the customer can make the difference between a 10% and a 2% conversion rate. Many companies will offer to send out high numbers of emails to recover carts, but if it doesn’t relate to their shopping cart, preferences or interests, there is very little chance it will convert. A better system automatically takes information from your site and triggers a timely, personalised email to the customer, with a strong incentive to go ahead and buy. #6 How well do they analyse your success? This will ultimately determine whether you carry on using a provider or not. It is important you understand how a company measures success, as this may be vastly different to the goals that you set. Many email retargeting companies measure success by looking at how many people click through from an email. This can be a misleading indicator of success, as it implies the customer has completed the purchasing process, when in fact they have just been redirected to the website. As abandonment recovery specialists, we appreciate the importance of measuring success rates in every channel we use, to form a better picture of its performance. The Optilead solution is no different. It is able to track visitors in real-time from when they first land on the company website, right through to when they abandon. This advanced tracking then shows who goes on to complete a purchase either on the website, over the phone, through an email, or in one of your high-street stores following your cart recovery campaign. Having the ability to track with this degree of accuracy is essential so that you can understand your company’s success. #7 Is it a bespoke system I can change myself? For companies that run on a seasonal trade, having a system that lets you control how you handle your leads is very important. Nobody cares more about your business than you, so having access to analytics and being able to make necessary changes will let you take full control of your own success. With a flexible back-end system you should be able to increase leads delivered during quiet times and hold them back during busier times. You should also be able to choose which communication strategy they receive, to optimise your remarketing strategy. #8 What sort of support do they offer? Be careful, because despite their affordability there are hundreds of cart recovery providers that are simply just a one-man-band, giving you little more than a basic email platform to send out template messages. This means you miss out on high-quality design and personalisation that engages consumers, and often comes with very little support if your open-rates are failing to reach your projections. Paying a little bit more a month ensures your campaigns are performing at their best. A poorly designed email will simply not earn a customer’s attention, or even worse, it could turn them away. 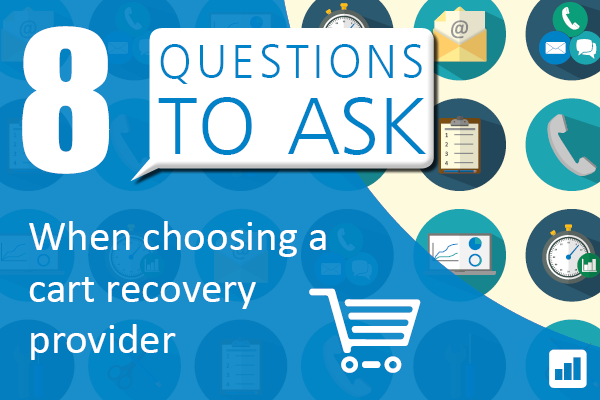 Deciding to use a cart recovery provider is the easy choice. But with the huge number of providers that now exist, we appreciate it can be daunting to pick the right one. By asking these questions, your company will benefit from a provider that truly enhances your customer engagement strategy – as well as driving your online revenue. It doesn’t matter if you are in Retail, Travel, Insurance, Finance, Utilities or Telecoms, phone calls are the most effective cart recovery channel at your disposal. Not only do they achieve a good contact rate over 65% (source Optilead), but they also regularly achieve conversion rates well over 20% – many times more than that of email, which rarely rises over 5%. Shopping cart abandonment is a problem that affects some businesses worse than others. For those with a proactive system in place, what was once a problem is now a great source of online leads. If you would like to know more about how you can manage online shopping cart abandonment for your business, feel free to fill out our contact form.